I picked up this book and Teaching Your Children Values (post below) gearing up for a new school year. I have loved being able to teach my children during their preschool years at home and this year I am teaming up with another mom in the neighborhood to do a joint "school" similar to ones outlined in this book. There were so many fun ideas in this book that I can't wait to use with our little 3 year old participants! 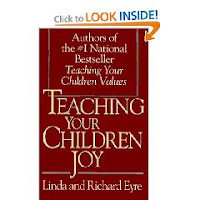 Teaching Your Children Joy discusses different 'joys' each child should learn to experience in life and each chapter discusses the joy and gives great examples and stories of how we can teach these as parents. They are fun easy no hassle ideas. I love that they aren't elaborate or hard to accomplish and that I feel like I can easily do and teach this book to my family. I love this book as well as the Values book by the Eyres and can't wait to start our preschool group this week. I recommend any book by the Eyres, they are inspirational and fantastic!